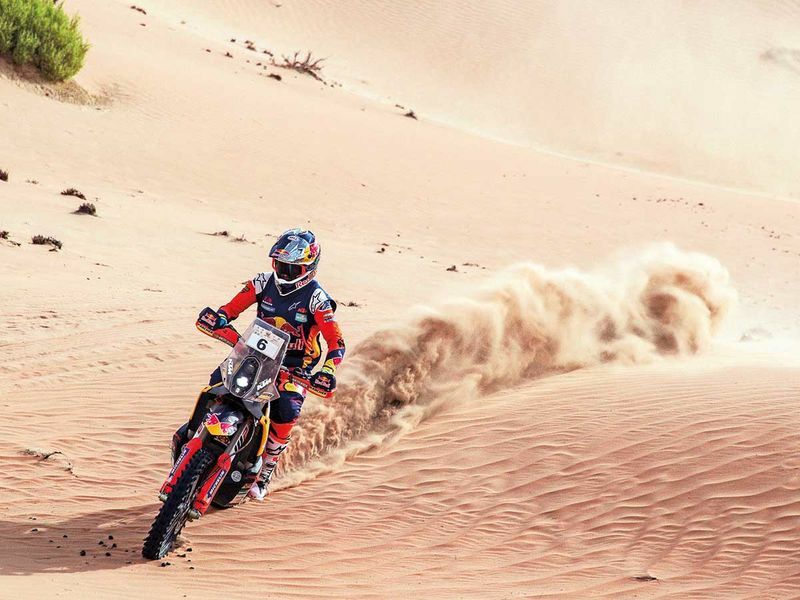 Abu Dhabi: Stephane Peterhansel cruised to his sixth cars victory in the Abu Dhabi Desert Challenge, while Sam Sunderland surged to his second bikes title in three years on Thursday. 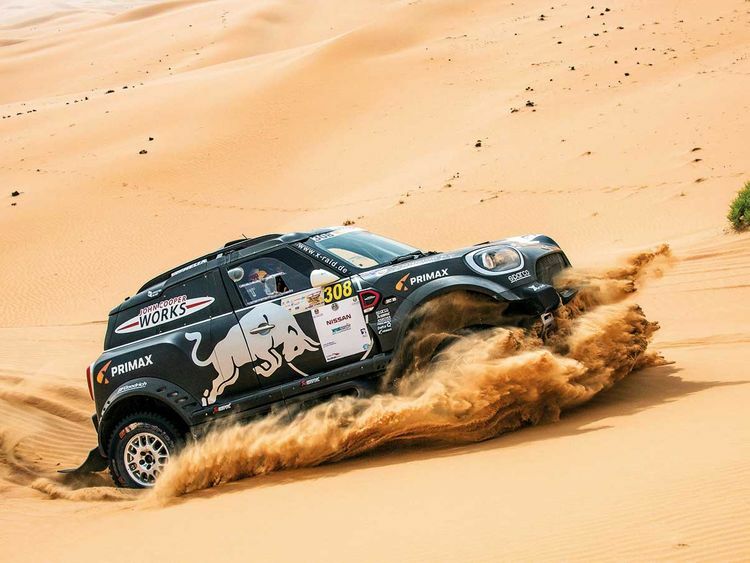 Avoiding any of the dramas which held up each of their main rivals over five days of punishing desert driving, they took their Mini John Cooper Works Rally home by 8 minutes and 48 seconds from the UAE’s Shaikh Khalid Al Qasimi and Frenchman Xavier Panseri in a Peugeot 3008 DKR. Sunderland obliterated the opposition on the final leg of the bikes, converting his slender 18s overnight advantage into an 08:20 winning margin from Argentine KTM teammate Luciano Benavides, still a junior and recording his first FIM World Championship podium finish. Chilean Jose Cornejo finished third, another 01:39 back, with Honda teammate Kevin Benavides, and American Andrew Short and Britain’s Ryan Blair, both riding Husqvarnas, completing the top six. Finishing fourth overall in the cars category, American Casey Currie in a Can Am Maverick X3 secured the buggies title ahead of Brazilian Reinaldo Varela who was placed fifth in another Can Am ahead of two-time winner Vladimir Vasilyev of Russia in a BMW X3. Qatari driver Mohammad Al Meer won the T2 production class in a Nissan Patrol which had a huge winning margin over Latvian Aldis Vilcans in a Toyota Land Cruiser. Kuwaiti’s Fahad Al Musallam on a Yamaha captured the quads title, winning by 01:13 from Poland’s Rafal Sonik. Peterhansel, who won the Desert Challenge bikes crown in 1996 before adding five cars triumphs between 2002-2011, had the look of a champion again from the moment he took the outright lead on the second leg. “This is an incredible moment,” he said at the finish. Sunderland clinched his second Desert Challenge bikes title in three years with the kind of performance which stamps him as a rider few can match when he is in full flow on his KTM. Starting seventh today with only a fragile lead over Chile’s Jose Cornejo, he basically had the rally won with barely a quarter of the 214km Abu Dhabi Aviation stage completed as he pulled in the riders ahead with a brilliant surge from the start. “I’m super happy with today and thankful for the team who have done a great job on the bike all week,” he said.